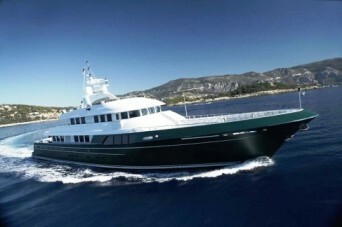 The Ron Holland Cheoy Lee Yachts 45m / 148’5” Transocean Explorer Motor yacht. This new 45 meter Transocean Explorer of the Marco Polo series was intended to live up to her name. Exploring the far reaches of the globe is the reasoning behind this concept. This new approach to a motor yacht combines the reliability and savings of commercial shipbuilding with the fascination and freedom of yachting. 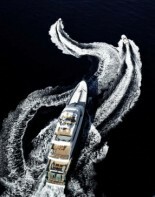 The Marco Polo series presents an interior arrangement for 10 guests and 8 crew that has very positive charter potential. Also, a low operation cost due to 35% fuel saving of the single engine configuration, plus construction details aimed at low maintenance, ensure a real commercial advantage. My response to this knowledgeable design brief of a very experienced yachtsman lead me to look beyond proven commercial hull types with naval architectural principles that had followed an evolutionary road influenced by wide ranging operational requirements. Although I wanted to incorporate the very best sea keeping characteristics of those vessels, I also wanted my personal experience of sailing thousands of ocean miles in a wide variety of sailing yachts to have an influence. My goal was to marry this experience with proven commercial naval architecture. This would place operational efficiency and sea keeping ability in the most extreme geographic regions at a higher priority than achieving the maximum accommodation. So often the accommodation volume seems to be the primary influence in many existing motor yachts. Aesthetic principles would also have an important influence on the new design. The Marco Polo Series hull lines feature fine forward water lines fairing into a low volume bulbous bow that drew on the recent experience of the latest military vessels. This approach maximises the ability of the hull to penetrate rough water conditions with reduced resistance and pitching moments, yet retains the advantages of increased range that the bulbous bow will produce. Soft mid sections and clean aft exit lines work together to ease the hull through sea conditions, no matter how extreme. A lot of thought has been given to the efficiency of the propeller, and both single and twin screw arrangements have been optimised for this design. The first off this design will feature a single propeller concept following the evolution of the world’s most efficient commercial ships. This has been fine tuned and verified by a series of scale model tank test studies. We have taken full advantage of the reliability of modern marine engines and drive systems, but as a back-up, Marco Polo will use a Schottel bow thruster powered by its own remote engine that also allows a ‘get home’ capability of 6 knots speed. The Marco Polo Series has a unique safety feature due to the separation into two distinctive engine rooms for the primary engine and the forward Schottel thruster ‘get home’ engine. Fire or flooding of the engine room will render most motor yachts inoperable. The propeller is uniquely protected by twin rudders and skegs and the stabilisers are similarly protected by oversized bilge keels.